2018 is really off to a great reading start, and that continued in March when I bumped the number of books I read up to 12, compared to 10 in January and February, thanks to 2 graphic novels I read on the 31st. But, it counts, and they were both excellent books, so it was great to both start and end my month with a 5 star read! I’d heard so many good things about My Lady Jane by Cynthia Hand, Brodi Ashton and Jodi Meadows, as well as the audiobook, but I somehow missed reading it before it expired from the library the first time, so when it back in again, I made it a priority to listen to. Once I started, it wasn’t hard to keep up with it, because I fell in love with this funny historical fiction with a twist about King Edward, who is dying, his cousin Lady Jane Grey, who loves books, and Gifford, who becomes a horse every day and only turns back into a man at night. 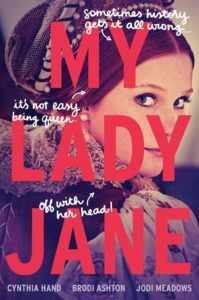 If My Lady Jane sounds a little mad, that’s because it is, but it’s just the perfect balance of humour and historical detail, with a charming cast of characters at the centre of it. I don’t usually enjoy multiple points of view, but it worked great in this case, and I could not even tell which author wrote which. The story itself is full of action, with a fantastically told plot that had me looking up historical facts as I went since it blurred the lines between fact and fiction and magic so well. The audiobook is also excellent and highly recommended if you’re looking for something fun. I can’t wait for the next book, My Plain Jane (about Jane Eyre) which releases in June! I probably shouldn’t have picked up Tell Me No Lies by A.V. Geiger, since I wasn’t a huge fan of the first book in the series, Follow Me Back, which is about a girl who doesn’t leave her house but meets the musician she’s obsessed with online using Twitter. However, the ending of Follow Me Back had such a fun twist I felt compelled to find out what happened next. Unfortunately, the mystery from the last book was solved in the first 20 pages and I should have stopped reading there. I’ve had Sorta Like A Rock Star by Matthew Quick on my bookcase for years and I’m trying to get better about reading those books, plus I really enjoyed his book Forgive Me, Leonard Peacock, when I read it a few years ago, so I figured it was finally time to pick this up. Plus I got an audiobook on loan from the library, which is also a good incentive for reading a book I might not have made time for with a paper copy. 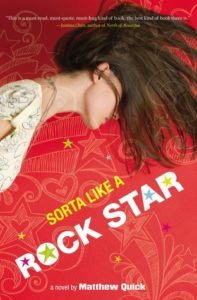 Sorta Like A Rock Star is the story of Amber Appleton, who lives in a bus and has a dog she adopted and a group of misfit boys she is friends with. She’s passionate about Jesus and has an upbeat attitude, despite all her hardships in life. It seemed unusual and a nice change to read a YA book with an optimistic narrator, but unfortunately Amber just really got on my nerves. The book was published in 2010, and maybe the slang just hasn’t aged well, but it’s really annoying. Amber also does some things that are very inappropriate like visit a teacher’s house, but somehow we are supposed to be on her side about it. Plus, her friends mostly end up feeling overly quirky and not like real people. Lastly, there’s a dark twist in Sorta Like A Rock Star which gave it an unexpected dose of realism, and I do feel like Quick tackles the more serious topics well (see Forgive Me, Leonard Peacock) but while I have one more book by him (The Good Luck of Right Now) on my shelf, I do feel a bit deterred after reading this one. But maybe I’ll find an audiobook and pick it up eventually. 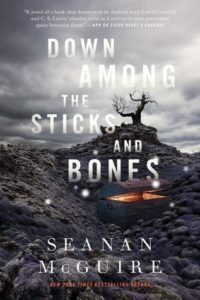 After adoring Every Heart a Doorway last month I was so thrilled when my audiobook library hold came in for the sequel, Down Among the Sticks and Stones by Seanan McGuire. While released as the second book in the Wayward Children series about a home for teens who have returned from other worlds and don’t quite fit in, Down Among the Sticks and Stones actually takes place before telling the story of the adventure twin sisters, Jacqueline and Jillian, had in one such world. Jacqueline and Jillian have always been put into categories (tomboy, girly girl) by their parents, and one day discover a doorway to another world filled with magic, mad scientists, and blood. Unlike Every Heart a Doorway, this story really focuses on only two characters, so there’s a chance to get to know them in a lot more depth. There’s also excellent world building despite the short length, and it explores a lot of important topics like identity, love, sisterhood, and jealousy. I loved Down Among the Sticks and Stones just the slightest amount less than Every Heart a Doorway, possibly because I basically already knew the outcome and therefore it was a little less exciting. That said, it was still a 5 star read and I’m still absolutely obsessed with the series and after finishing this book I immediately dove into book 3, Beneath the Sugar Sky. I don’t read a lot of paranormal fiction, but the comparison of The Wicked Deep by Shea Ernshaw to Hocus Pocus and Practical Magic really caught my attention and I’m so glad I decided to give this debut novel a try. This story takes place in the cursed town of Sparrow, where 200 years ago 3 sisters were sentenced to die, and now each summer they return to steal the bodies of girls and use them to drown boys in the harbour. Although The Wicked Deep had a slow start, I was soon immersed in the creepy, mystical world Ernshaw created. I actually thought this would have a humorous tone because of the Hocus Locus comparison but instead there’s just a dark ominous feeling to the story, which I greatly preferred. The story is really well plotted with plenty of twists, including a few surprises, and some clues I didn’t even notice until my friend Ambur pointed them out when we discussed the book afterwards. This is definitely a book I read for the story and atmosphere, rather than the specific characters, which asides from the narrator, Penny, don’t have a lot of depth, but I really enjoyed the mystery and story, as well as the writing. 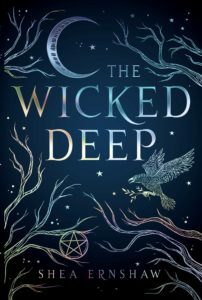 While I appreciate a standalone paranormal novel, I’m still not quite sure how I feel about the ending of The Wicked Deep, which left me a bit unsettled, but perhaps it is a sign of Ernshaw’s skill that I’m still left questioning and uncertain long after turning the final page. The third book in the Wayward Children series and sadly the most recently released one is Beneath the Sugar Sky by Seanan McGuire, and it was bittersweet to listen to the audiobook of it this month, knowing I’d have to wait almost a year for the sequel. Still, it was so lovely to get back to this cast of characters, as the story picks up a little while after Every Heart a Doorway, which I read last month. 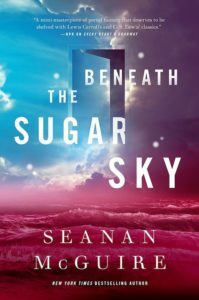 Beneath the Sugar Sky is the story of Sumi, who died before her daughter Rini could be born, but somehow she was born anyway and now she’s trying to bring her mother back, with the help of a gang of familiar faces (and a few new ones) from Eleanor West’s Home for Wayward Children. The quest storyline was a little more predictable and less dark than usual from McGuire, but still delectable book full of wonder characters and unfamiliar worlds. This book is just jam-packed with creativity, gorgeous writing and just an enchanting story all around. I’m so glad I picked up this series, but maybe I should have waited a bit longer because now it’s going to be almost a year until book 4, In an Absent Dream is released, and I cannot wait. Back when I read A Heartbreaking Work of Staggering Genius I loved Dave Eggers, but it’s been quite a few years since then and my most recent read was Your Fathers, Where Are They? And the Prophets, Do They Live Forever?, which I wasn’t overly impressed by. 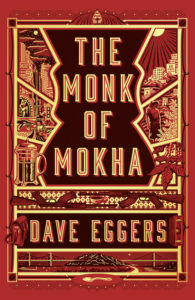 That said, when I saw the blurb for The Monk of Mokha by Dave Eggers, a true story about a Yemeni-American man, Mokhtar, who was raised in San Francisco but travels to Yemen to bring Yemeni coffee to America only to get caught up in a civil war, I was intrigued and decided to pick it up. I’m so glad I did. Even though The Monk of Mokha is non-fiction, it reads like a novel, full of tension and adventure and a passionate main character, Mokhtar, who you really want to not only survive but also to succeed. This book is exceptionally well-written, it has just the right amount of detail and it’s a very emotional story that feels as if it could have been written by Mokhtar himself. Sometimes it did feel like he was doing ridiculous and unnecessarily dangerous things, but I guess that’s part of what makes this true story translate so well into a novel. It was especially fascinating to learn the history as somebody who didn’t know much about coffee, or Yemen, going in. The book was a little slow in some parts and I did wish the ending was fleshed out more, but I guess that is really life, and it is still going on. I’m definitely rooting for Mokhtar, and I’ll have to pick up more of Eggers’ backlist I have on my shelf, after this reminder of how good his writing can be. 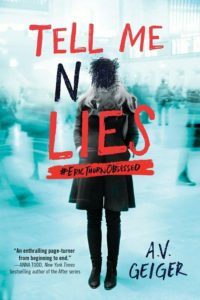 The latest dark thriller I’d seen everywhere I looked and therefore, as somebody who loves dark thrillers I felt obligated to pick up, was The French Girl by Lexie Elliott. This story is told ten years after a group of 6 friends spend a week in the French countryside, where they meet a beautiful girl next door, only for her to disappear. When her body appears a decade later, the same group of friends is under suspcison, especially Kate, the narrator. The French Girl is certainly more of a mystery than a thriller, as I found the story pacing quite slow and quite a lot of time dedicated to Kate’s job/new business, all of which could have been eliminated from the book and I would not have missed it. I was a bit surprised when I finished the book and realized it was only ~300 pages, give how slow things moved, and the only thing that helped was that I listened to a chunk of it on audiobook. The other main issue I had was that I really didn’t care about Kate or connect with any of the characters. The dynamics between them were interesting, but I felt no emotional attachment, so I didn’t care much what the outcome was besides hoping for a good twist (it wasn’t, it was predictable). The main highlight of the book was Elliot’s writing, since I really enjoyed her language, despite the slow pace. 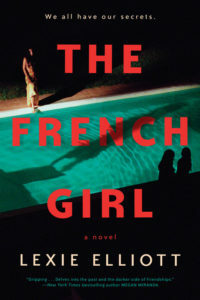 Overall, it definitely wasn’t a standout for me, but if you are looking for a character-driven story with a mystery element you may enjoy The French Girl. While I might enjoy the occasional superhero movie, I’m not really interested in superhero books, and after reading Renegades by Marissa Meyer last month I’m feeling especially skeptical about the genre. That said, I really enjoyed the first book in the DC Icons series about superhero as teenagers, Wonder Woman: Warbringer by Leigh Bardugo, so I decided to give book 2, Batman: Nightwalker by Marie Lu a try. I also loved the first book I read by Lu, Warcross (It even made my top 10 books of 2017! ), so I thought if I’d like any superhero book, this would be it. Batman: Nightwalker tells the story of Gotham City during a time when it is being terrorized by the Nightwalkers, who are killing the city’s wealthiest. 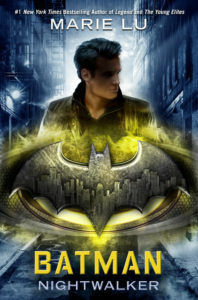 After a run-in with the police, Bruce Wayne, who just turned 18 and inherited his family’s fortune, is assigned with community service at Arkham Asylum, where he meets one of the Nightwalkers, who just so happens to be a beautiful and brilliant teenage girl. Yes, I realize this is a novel about a superhero, but I did feel the suspension of disbelief required was more than I expected. While the novel is pretty well-written, it just doesn’t do anything especially original with the story. I could also have skipped the dream sequences, while the action scenes were a bit too short. However, the main issue is that Bruce himself is quite bland and does not come across as very intelligent, while the villain isn’t especially exciting either. That said, it is an easy, quick read with a couple fun twists and Albert, who I always love, it just didn’t live up to the expectation that I had for Lu’s writing. 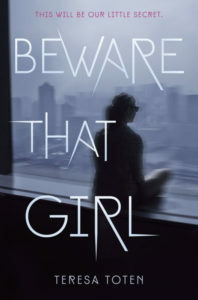 I managed to pick up another book I’ve had on my shelf for years this month, thanks to the audiobook from the library, and that’s Beware that Girl by Teresa Toten. I’m actually terrible at listening to mystery audiobooks because I always end up reading the paper copy so it goes quicker, and Beware that Girl was no exception. It is a psychological thriller told from the perspective of two teenage girls attending an elite private high school in New York. Kate is the scholarship kid with no family and a mysterious past who wants nothing more than to go to Yale, while Olivia is a wealthy student, repeating the grade missing time the previous year. They both have secrets, which become threatened by Mark Redkin, a young handsome man who joins the administration at the school. I have seen Beware that Girl was compared to a slightly darker Gossip Girl, and I completely agree with that comparison. I enjoyed Toten’s writing a lot, it had an easy to devour quality, but it really did get quite over-the-top, especially towards the end. There’s a scene that is supposed to be dramatic but almost made me laugh out loud it was so ridiculous. The story also basically uses abuse as a plot device, which is unfortunate. Mark is also super creepy from the very beginning, so it’s hard to believe everyone is swooning over him when as a reader you’re so disgusted. Overall, Beware that Girl was an entertaining book that kept me reading to learn the secrets, even though I ended up disappointed when I finally learned them. 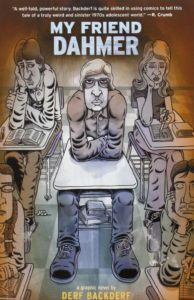 I had never heard of My Friend Dahmer by Derf Backderf before I saw it featured on a BookTube channel I watch, but after it got rave reviews there I was really intrigued by this graphic novel, written and illustrated by somebody who went to highschool with Jeffrey Dahmer, and reflecting on the years before he came an infamous serial killer. This is an incredibly original graphic novel from a very unique perspective, and I enjoyed both the writing and the art it contained. While at times it does provide a small amount of sympathy for Dahmer, it does show how often there was a chance to help or stop him, and that opportunity was missed with devastating consequences. From a non-fiction perspective, I also found it very interesting to read since I didn’t know much about Jeffrey Dahmer going in. Overall, My Friend Dahmer was an intriguing read, and while I’m not really sure who the correct audience for it is, if it interests you, I would recommend picking it up. Speak was definitely one of the most powerful books I read as a teenager, but I’m always a bit hesitant when I learn about an author revisiting a classic. 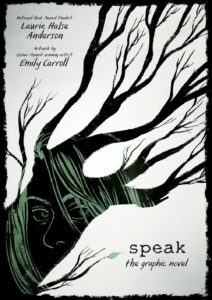 Luckily, Speak: The Graphic Novel written by Laurie Halse Anderson and illustrated by Emily Carroll only adds to the emotion and impact of the original young adult novel. I adored Carroll’s illustrations in Through the Woods but found the story lacking; so paired up with the writing prowess of Anderson, this is the perfect match. Carroll perfectly establishes the ambiance through beautiful black and white illustrations, and the story flows beautifully. Speak: The Graphic Novel is definitely true to the original, although slightly modernized, and I highly recommend it whether you are brand new to the novel or have read it before. This is probably my favourite graphic novel I have ever read. Well, there they are. 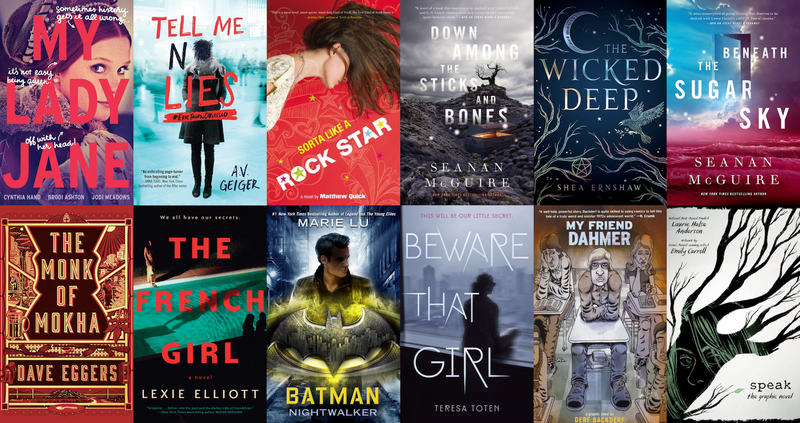 Better late than never, especially when I’ve got some really standout reads from March. Have you read any of these books? Let me know what you’ve been reading lately!